Recently we have been getting water hammer in the master bathroom. You know, it's that obnoxiously loud humming noise in the wall that goes off whenever you turn off the water or flush a toilet? Sounds relaxing, right? Luckily I know how to fix this problem. 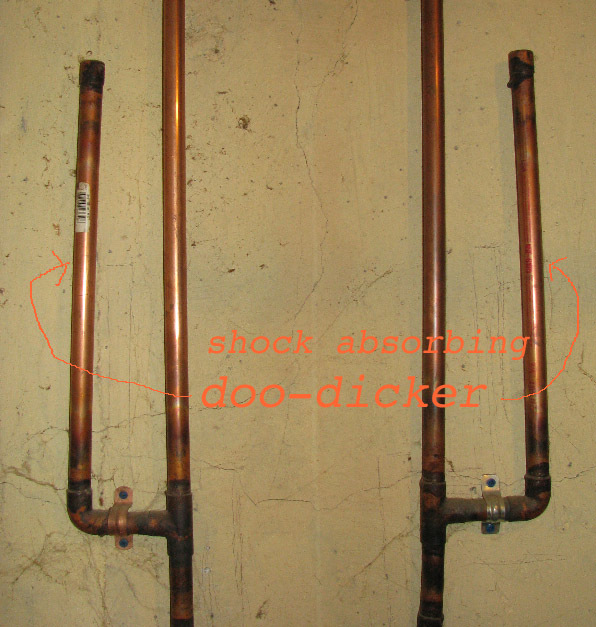 Water hammer occurs when the shock absorbing air chambers, here referred to as doo-dickers, fill up with water. Apparently it is common for this to happen over time. To fix this problem you basically just need to drain the plumbing system. First turn off the water main. Mine is under the stairs, with a giant red handle. Open all the faucets starting at the top of the house. Flush all the toilets, then open the lowest water source (in our case the hose in the garage) and let the water run out. After the house is completely drained, close all the faucets and reopen the main. That way air pressure will build and refill all those little chambers throughout the house. OMG! I am so going to try this! I'm sure we wake up half of the neighbourhood whenever we flush the toilet in the night! Great post! Generally plumbing problems such as bursting pipes and clogged drains occur due to the use of low quality plumbing supplies. Last month, I have encountered the same problem in my house. I have called a plumber to fix the problem and he suggested me replace the old plumbing supplies with the new South Coast Sales plumbing supplies. Plumber told me that the whole water supply system was damaged so I need to replace it. After replacing the old gears, I have not faced any plumbing issue yet and now the condition is better and there is no drainage problem in my house.